We don’t want to go into details this time, and rather wouldn’t name call anybody, because it’s not totally clear yet who’s fault this incident was. But you can be sure that as soon as we figure it out, we’ll publish a writeup about all the details. Because no startup – and its backers – should be ever put into such a situation! That is indeed bad news. But thanks for being upfront about it. Thank you for understanding our situation, and following us! I see in your configuration example you apparently will be able to configure a key to be dual action, and I infer from the syntax one action for a key stroke and another for holding the key down. If so, will we be able to configure the Mouse key to be Esc for keypresses and Mouse mode for holding? I use Caps Lock as escape on my current keyboards and I've grown quite used to that, and not having that will be quite an adjustment when I get my keyboard. Thanks for being up-front about the issues, can't wait for September. Hi Travis, It's indeed perfectly possible to configure the UHK the way you suggested. Dual role keys for the win! Thank you for your understanding regarding the delay. We're also looking forward to September. Thanks for the update! Hopefully this has nothing to do with the bank trying to hide from the Panama-papers and just totally forgot to transfer the money ;-) Luckily I still have another keyboard :-) and I hope that the two months delay also give you a little more time to stabilize the hardware and software. As a mechanical engineer myself I know that creating molds is hard and it never goes like intended. Looking at the agent source-code on github I see you are using Handlebars for templating. Ever thought of using EmberJS (www.emberjs.com) created by the authors of Handlebars? You're right that in some ways this delay is a good thing. We'll definitely make a good use of the extra time. Hi László, could you please update your profile picture so that we can see those gray hairs? :) Unfortunate as I was really really stoked that July was coming closer and closer but things happen. Stay strong and build the best keyboard out there. Looking forward to September! Go go go! Thanks for the encouraging words, we're working on it! Looking really forward to the UHK. If it's as awesome as I think it will be, it's totally worth the two months. Thank you for your understanding and support, Liam! Laszlo & team, fantastic prototyping and cheering on your to-production efforts (as i have one on order!). So I dread to suggest, as i dont really think other fundamental design choices should be made anymore (mcu & firmware)… but have you considered basing your mcu & firmware off existing open source work: eg GH60, TMK, kiibohd. 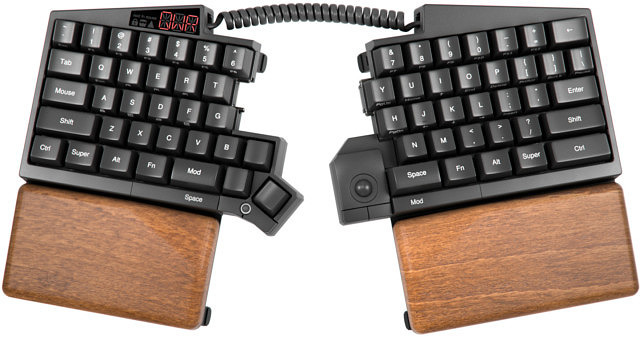 The latter in particular, on which the 'symmetrical' usbc-connected inifinity ergodox is based on; quite akin to split design of uhk. Undoubtadly, your HW design ROCKS! Fist up, thank you very much for your support, and encouraging words! We're already using the KiCad library of kiibohd because we share a couple PCB footprints with them. We can't make USB type C happen because of the lack of space. Other firmwares don't work for us for a couple of reasons. The modular architecture of the UHK is one of a kind, and it calls for a considerably more sophisticated firmware than the existing offerings. Also, the UHK stores its configuration in the EEPROM instead of compiling it into the firmware like other Open Source firmwares. This is yet another big difference that has a number of advantages. So to sum it up, we're aware of the related projects and use them as much as possible, but given our design constraints our options are rather limited, and we inevitably need to build a lot of stuff from the ground up.